Fashion may be fleeting in the eyes of some, but not for Brandice Henderson, the founder of Harlem’s Fashion Row, a comprehensive fashion incubator for black fashion-design professionals. If she has her way, the power and impact of African-American contribution to fashion design will be eternal. To that end, Henderson gathered together a powerhouse crew of New York’s most influential black bloggers, editors and journalists for the first Black Fashion History Dinner on the eve of New York Fashion Week 2018. 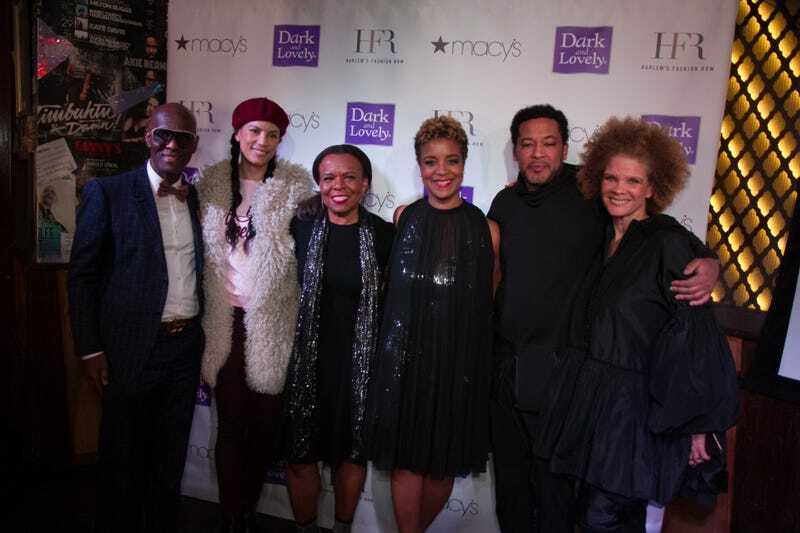 Famed restaurant Red Rooster of Harlem was the venue for a panel discussion featuring star guest Dapper Dan, among others, moderated by veteran fashion journalist Teri Agins, who is the author of the insider fashion books The End of Fashion and Hijacking the Runway. Some say that Dapper Dan, through his early-’80s remixing of logo brands like Gucci, MCM and Louis Vuitton into one-of-a-kind pieces for the hip-hop and elite street hustlers, defined a golden era of fashion. There was a time when Dan was known as the “King of Counterfeit” for reworking motifs of European heritage designers infused with an uptown swagger—most recognizably his custom leather tracksuits hand-screened with LV and Gucci logos that caused the conglomerates to sue him out of business 20 years ago. Post-panel, Omar Salam, a relative unknown, yet one of the most skilled and exciting designers now showing, gave a knockout presentation of his Sukeina line. Salaam killed it with marabou-trimmed cocktail dresses, structured jackets and sleek sheaths with embroidered bodices. Harlem’s Fashion Row gave us a very bright glimpse at black fashion’s future built on our fashion legacy. The evening’s mission? To harness our collective power to share information and make black-owned businesses grow. Sharing information is exactly how Harlem’s Fashion Row began. By chance, Henderson met Lois Alexander Lane, the fashion historian who founded the now defunct Black Fashion Museum, who at the time was compiling a book project on the history of African-American designers, called Fashion in Color. It was a labor of love, which, upon her death, Lane passed on to Henderson to continue. To date, they’ve presented over 50 designers—including CFDA winner Telfar Waraire Boswell—to buyers, press and fashion professionals. Henderson, now profitable through a combination of speaking engagements, corporate-sponsored events and selling designers on her site, developed by Harlem’s Fashion Row, has an even bigger endgame in mind. So what can we do to support the future of black fashion design? “Talk about it. Even if you can’t buy it, talk about it!” Henderson says. Which makes sense: Gucci is not famous in our community because we all buy it but because we all talk about it.